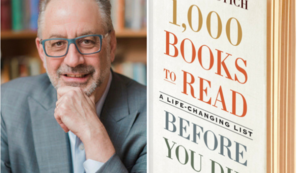 Ridgefield Library will host an author talk with 1,000 Books to Read Before You Die author James Mustich on Thursday, November 29 at 7 p.m. Click here to register. With Mustich's new book, readers will never again be left wondering: "What to read next?" It's as compulsively readable, entertaining, surprising, and enlightening as the thousand books it recommends, and it celebrates something we all love--the joy of discovery. Books will be available for sale and for signing courtesy of Books on the Common. James Mustich began his career in bookselling at an independent bookstore in Briarcliff Manor, New York in the early 1980s. In 1986 he co-founded and was for two decades the guiding force behind, the acclaimed book catalog, A Common Reader. He subsequently worked as an editorial and product development consultant for publishers and booksellers and is currently Vice President for Digital Product at Barnes & Noble. Ridgefield Library is located at 472 Main St. in Ridgefield, Conn. For more information, visit ridgefieldlibrary.org.